300 BCE Subrahmanya Temple at Saluvankuppam, Tamil Nadu, India unearthed in 2005 has 2 layers of constructions. First one was a brick construction made around 3rd century BCE (Sangam Period) and on top of it, another granite layer was constructed during Pallava reign around 8th century CE. This temple was discovered by a team of archaeologists from the ASI based on clues found in a rock inscription left exposed by the 2004 Indian Ocean tsunami. 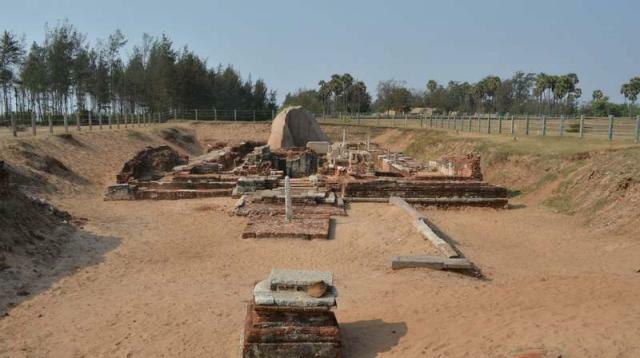 Initially, excavations revealed an 8th-century Pallava-era shrine. 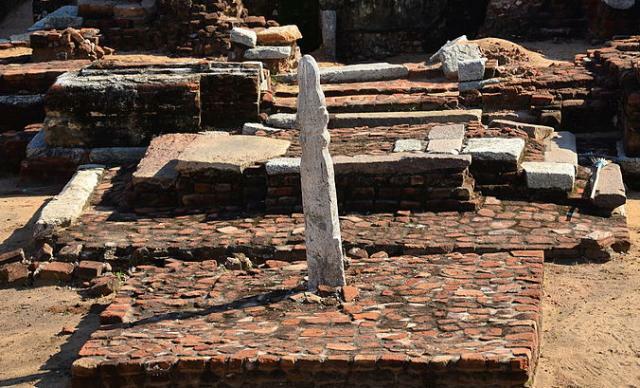 Further excavations revealed that the 8th-century shrine had been built on the brick foundation of an earlier shrine. The brick shrine has been dated to the Sangam period. Unlike most hindu temples, which face towards east, this Subrahmanya temple faces north. After the 2004 Indian Ocean tsunami had subsided, archaeologists discovered rock inscriptions which were exposed by the tsunami waves close to the hamlet of Saluvankuppam, near the UNESCO-designated World Heritage Site of Mahabalipuram. Inscriptions by the Rashtrakuta king Krishna III and the Chola kings Parantaka I and Kulothunga Chola I spoke of a Subrahmanya Temple at Thiruvizhchil (the present day Saluvanakuppam). Original brick shrine was destroyed either by a cyclone or a tsunami which took place 2,200 years ago. Pallavas built a granite temple on the brick foundation in the 8th century CE, which also was likely to have been destroyed by a tsunami. Second tsunami must have occurred in the 13th century CE as the latest inscriptions which speak of the shrine have been dated to 1215 CE. Vasanthanar, a Brahmin woman offered a grant of 16 kazhanjus. Kulothunga Chola III (1178 – 1218 CE.) on a pillar which can be dated back to 1215 CE.